This Irish scarf features fringe at both ends. 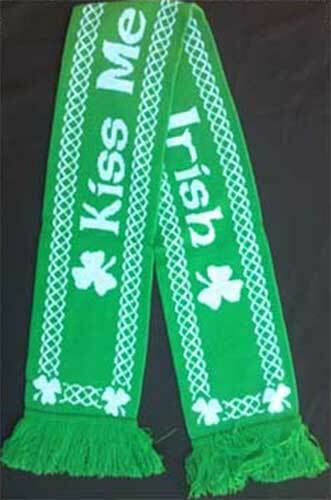 This Irish scarf features the witticism Kiss Me I'm Irish along with shamrocks and Celtic knots. The Kelly green shamrock scarf is double sided and measures 6 1/2" wide x 52" long. This polyester winter scarf is received with Celtic knot and shamrock history cards, complements of The Irish Gift House.